Our licensed Speech Language Pathologists treat patients with speech, language, cognitive communication and swallowing disorders resulting from a stroke or neurological condition. One on one therapy sessions are conducted in the privacy of your room. 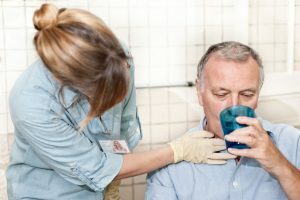 Swallowing disorders in adults occur as a result of a medical condition, injury or neurological event. The goal of our Speech and Language Pathologist is to return the strength and movement of a patient’s muscles back to their prior level of function through the use of oral motor exercises. Texture analysis is used to determine the safest and least restrictive diet for patients. Patient and Caregiver training with compensatory strategies is provided to increase safety of swallow. Neurological conditions may cause a person to lose their ability to communicate. Our Speech Language Pathologist will develop an individualized treatment plan to help rebuild language skills such as: word retrieval, expanding verbal utterances, and enhancing auditory comprehension. Our highly skilled Pathologists will assess and develop Alternative Augmentative Devices to increase communicative success for patients who have impairments in verbal communication.